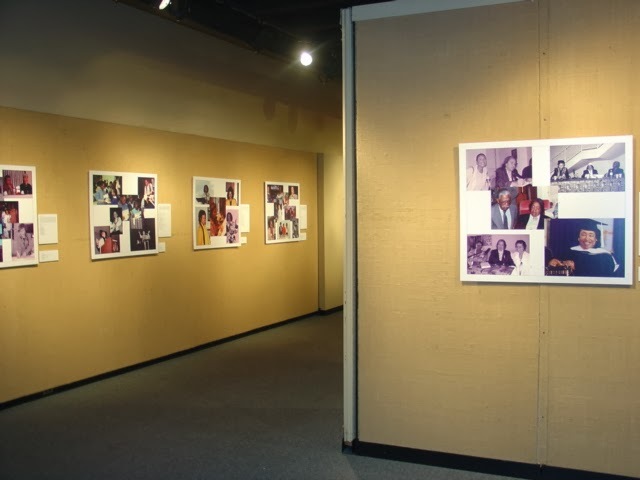 At about the mid-point of my first semester at SIUE in 2003, I visited Eugene B. Redmond at his home and began looking through his wonderful photographs of poets, artists, musicians, and people he had encountered on his many travels. During the marathon conversation we had that day, I told him that we should immediately start talking about "when" and not "whether" we'd coordinate an exhibit featuring his images. During our discussion that day, I also asked Redmond if could we start referring to his many items -- books, flyers, photographs, etc. -- as a "collection" as in the "EBR Collection." Over the next few months, we prepared a showing of his photographs. And then, we prepared another exhibit and another and another. 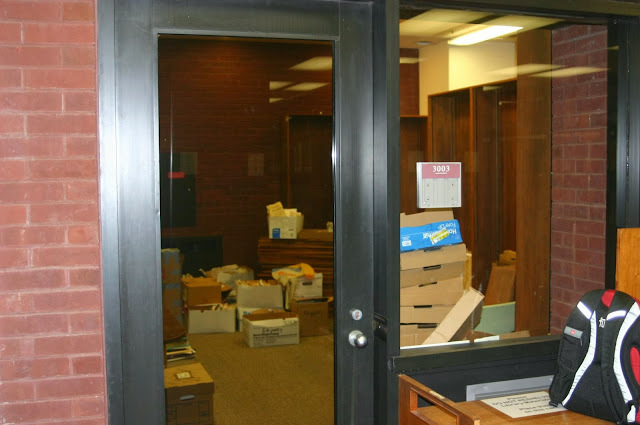 After years of organizing exhibits, I received permission to use an old storage room on the third floor of Lovejoy Library to host mixed media exhibits and to showcase aspects of Redmond's collection. We could call the space "The Eugene B. Redmond Reading Room." After about a year, library and university officials begin to take steps to organize a larger Redmond reading area. To alleviate any confusion, they asked that I change the name for the room that I was using, so the Redmond Reading Room began known as the Underground Reading Room. What follows is a brief visual narrative on the exhibits from the EBR Collection that led us to the Underground Reading Room. 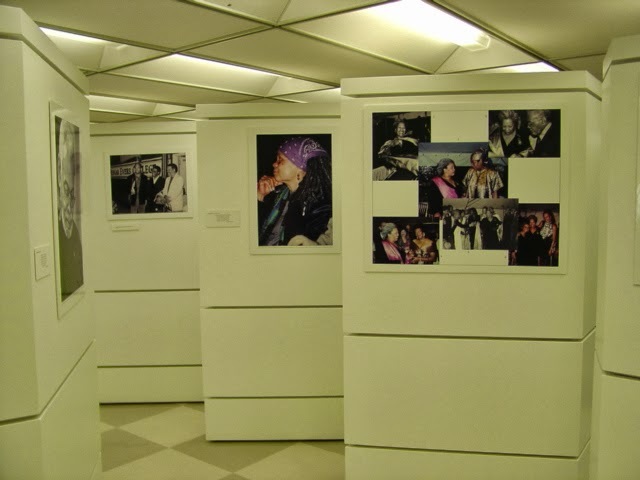 Second exhibit "Visualizing Black Writers: An Extra-literary Exhibit from the Eugene B. Redmond Collection," Feb. 2004. Univ. of Ibadan; Ibadan, Nigeria. Feb. 2004. Univ. of Ibadan; Ibadan, Nigeria. Sanchez & Redmond touring “Black Arcs of the Blues: An Extra-literary Exhibit on Amiri Baraka and Sonia Sanchez from the Eugene B. Redmond Collection.” James Madison University. VA.
Illinois University Edwardsville, Morris University Center Art Gallery. February 1 – March 2, 2005. 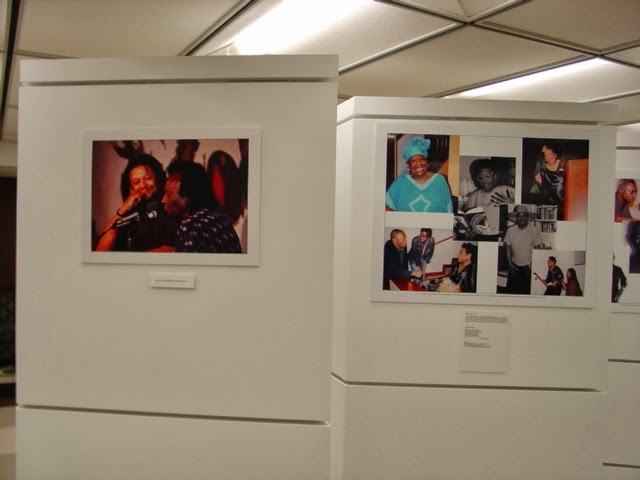 “Visualizing Black Writers: An Extra-literary Exhibit from the Eugene B. Redmond Collection.” Gorgas Library. The University of Alabama. November 10 — December 5, 2005. Storage room on the third floor of Lovejoy Library, SIUE. August 2010. Eugene B. Redmond Reading Room, Lovejoy Library, SIUE, Sept. 2010. 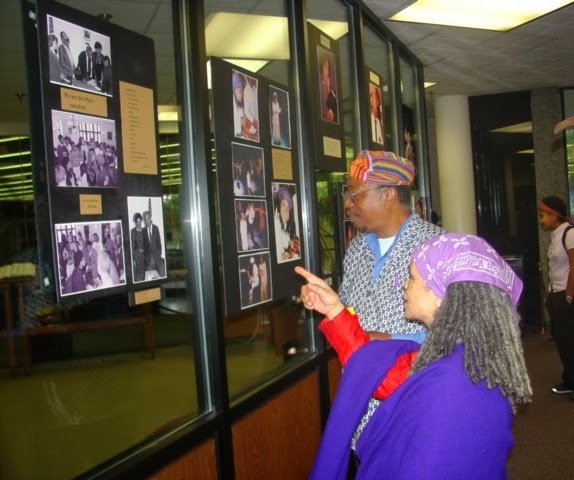 Eugene B. Redmond tours exhibit in EBR Reading Room, Lovejoy Library, SIUE, Sept. 2011. Students participate in mixed media exhibit in the Underground Reading Room, Lovejoyy Library, SIUE. October 2012. Student reads views Maya Angelou images and poem in the Underground Reading Room, Sept. 18, 2013.